﻿Earlier this spring I contacted several auctioneers for a farm and home estate auction in the Kalamazoo area, and would highly recommend Jerry and Big Bear Auctions. The bidding, fees and terms were﻿ favorable over others, and exceptionally fair. Just as important to us however were the care and interest, as well as their friendly personality to want our business and explain the process and steps to conducting﻿ the auction. Staging and progression to auction day, broad advertising channels over our region, and quality pictures and description of personal property were excellent. The staff and team managed set up﻿ and organization on auction day, as well as provided porta-potty services. I found that Big Bear Auctions has a great reputation and quite a good following of buyers, and staff participated in property clean-up afterward. The proceed check was prompt and mailed as promised. Thanks to all at Big Bear. I would highly recommend Big Bear Auction Company. From the beginning to the end the whole experience went smoothly. We had planned to have an Auction and Jerry recommended advertising it with a buy it now option and it sold within a few days. Jerry and Aimee were always available, returned calls promptly and truly were concerned caring professionals. 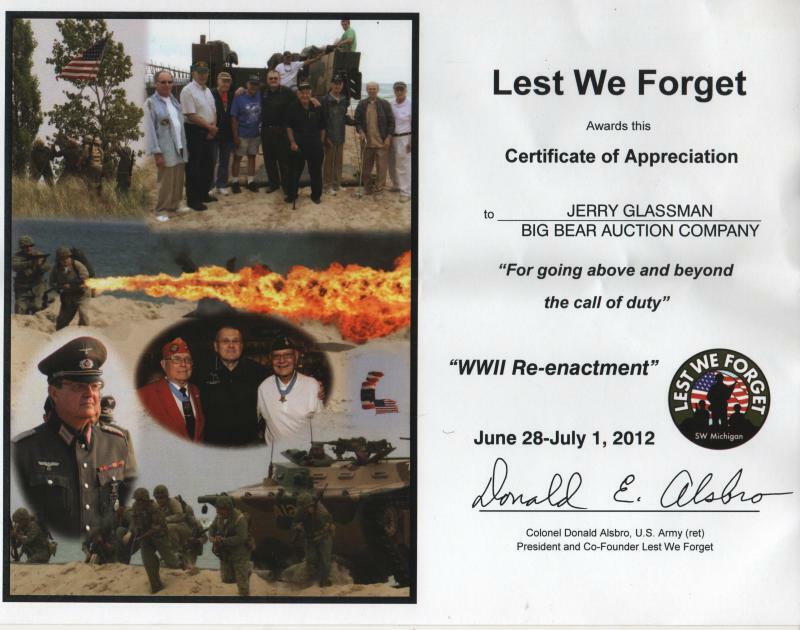 We gratefully acknowledge Jerry Glassman for his contribution to our annual For Now and Forever Fund Raising Event. Your generous contribution will help the students of Bridgman Public Schools for years to come. Your willingness to be a great community neighbor is greatly appreciated. Willie and Lamar did a great job as auctioneers for the Rocky Mountain Elk Foundation banquet on February 18. We had a highly successful banquet and raised a record amount of money for the cause based on our 17 year history as a committee. Half way through the auction a note was passed up to the podium complimenting the auctioneers. Willie and Lamar donated their time and for that we thank them very much. At the end of September we were honored to have the Hard Rock Café and the Four Winds Casino host an event to benefit our organization. They asked us to bring our own auctioneer and wanted us to have a time to ask the crowd to fund the mission. I was super nervous and not sure who to call and who could handle such a request. Jerry came to the rescue. More than coming to the rescue, he became a HERO. He worked the room and asked people to fund the mission and talked about breast cancer and why they should buy mammograms for women in need and when people didn't raise their hands and silence made me want to freak out...hecalmly handled the crowd and without blinking an eye he got the crowd motivated and bidding. Without Jerry, that moment would have NEVER HAPPENED. Thousands of dollars were raised to help women who didn't have insurance to get a mammogram! Lives were saved and hearts were touched. He wasn't just an auctioneer, I am sure he had on a pink cape that night. Thank you so much for making an impact. Anyone can ask for money, but he asked for support and that made all the difference. Thank you again for a great auction experience! I think I speak for everyone that we felt that Big Bear did an excellent job with our auction. The results speak well for situation, despite a dreary day, the attendance was great and it appears that almost everything is gone from the premises. Working with yourself, Jerry and the crew was a pleasant, (and sometimes entertaining!) event and we appreciated the professionalism shown to both the attendees and the family. The care to keep everyone dry and warm(as much as possible) I’m sure was noticed. I was very impressed with the service Big Bear Auction Co. did with the auction of Mom's house and stuff. I myself do not go to auctions and I was not sure how this was going to work. Well I know now!!! All of the staff were so helpful ---- sometimes funny ?? ?--- very caring -----and now great friends--- by helping us get this big big job done,with out more work then we could handle. The home was sold to good people and we are so happy for that. Her many crafts items have a new home to be worked on and enjoyed. I think the most we can say is this was done so well and quickly --- and we got more than what we would have expected. Our family used Big Bear Auction Services and would highly recommend them. We were very pleased with their professionalism of all their staff and the results of the auction was quick, easy and fun. I have the distinct privilege of telling you about our great experiences with Mr. Jerry Glassman. Jerry is a well known and highly recommended auctioneer around the county and at the Berrien County Youth Fair for many years. 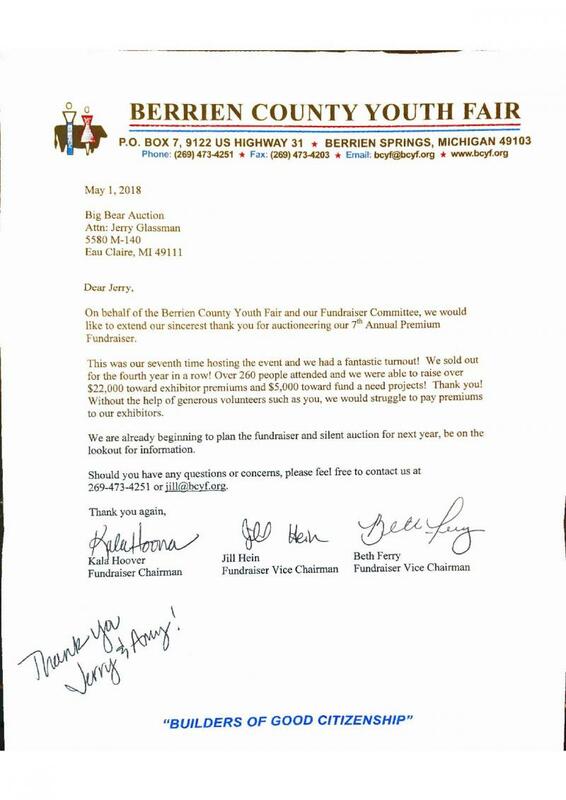 As chairwomen of the Berrien County Youth Fair fundraising committee, Jerry was the first to come to mind when we decided we were going to implement a live auction portion to our annual fundraiser dinner dance. We have utilized Jerry as our auctioneer at our annual Berrien County Youth Fair fundraiser dinner dance for 3 years. We have found him to be punctual, reliable, easy going, honest, courteous and most of all fun! Jerry works very hard to get us the most dollars he possibly can for each live auction item we have. He knows it's a fundraiser for our county fair, and that each dollar helps our youth exhibitors. Jerry and his bid takers take as much time as needed and talk one on one with potential buyers to help make the sale. Jerry knows most of the audience by face or name, and even it he doesn't he'll still talk to you like you're an old friend. He interacts well with our DJ and makes the auction fun and run smoothly. We cannot sing high enough praises for Jerry Glassman and his crew for any auction, whether it is a farm auction, livestock auction or even a fundraiser auction. We have been very pleased with Jerry and plan to use his services for future years at our fundraiser auction. We recently contracted with Big Bear Auction Barn in Eau Claire, MI to sell our farm equipment, irrigation pipe, and other miscellaneous antique items. Jerry, Aimee and their employees are awesome!!! Hard working, trustworthy and extremely time-efficient are only a few of their best qualities. Our items were sold at both the online auction service and the traditional Big Bear Auction Barn. Everything was sold as quoted and we were very pleased with our profit. Best deal ever!!! Big Bear is definitely the way to go for all farm, estate, or single item sales. We are very grateful to have them in our community. This September we contracted with Big Bear Auctions to handle our Estate Auction. We found Big Bear Auctioneers to be very professional, knowledgeable and extremely capable at their business. The set up crew was industrious, organized, fast, cheerful and overall a pleasure to work with. Big Bear’s rates were highly competitive and fair compared with other options we checked into. Overall the auction experience was well organized and went off very smoothly. We were extremely pleased with how everything was handled and would highly recommend Big Bear to anyone that has a need for their auction services. It's nice to know that there are still people who take such pleasure in doing special things and making others feel good. Thank you so very much for all your help. I appreciate the reduction in the commission. I am very happy and surprised with the amount I made. It has been a very big help. Thank you for helping us at the 2014 Berrien County Youth Fair. Your time and expertise you put into auctioneering are greatly appreciate3d by the Auction Committee. Our auction raised a total of $520,226.54 for the youth of Berrien County. The youth of Berrien County appreciate all your time and talents that you donate to the fair. That closing statement is better! Thank you for all the hard work you two and your team put into this! Any chance I get, I will share this story, and my totally positive recommendation for your services. We would like to thank you and the Big Bear Auction team for their great services provided in support of our auction. The professionalism demonstrated by the entire auction team during setup, was outstanding. You handled our personal items with care and respect and were able to garner good value for each item sold. Your auction service exceeded our expectations and we are very pleased that we had selected Big Bear Auctions to organize and run our auction. Sometimes I get so wrapped up in all that goes on around me that I forget to say "Thank you" to the people that make my life so blessed...Thank you for your friendship and for your business! I appreciate it so much. Thank you so much for the great job you and your team did on my estate auction. My wife passed a few months before. We were married for 45 years and had accumulated a lot of stuff. Going through everything would have taken me another lifetime and would have added to the pain. You and your team came to my rescue. You did more than I expected. I gave them no direction but they just seemed to know what needed to be done. They worked tirelessly to organize everything and make the house presentable for auction. Additionally, they looked for things they thought I might want to keep and set them aside for me. They kept me informed as to what they were doing and when. I could not be happier with the service you provided. Thank you for all your time, effort, hardwork, professionalism and expertise in making our fathers auction a huge success. We could never have done this without you and are grateful that you took on this difficult job. You two are such a huge blessing to our family. Thank you so much for all the work that you put into the auction, and donating all your time to pull off a wonderful event for Kahli. We truely appreciate you more than you will ever know! I want to start by thanking you for handling everything so well at the Labor Day auction & for taking care of our items in my absence. I'm always surprised by the positive results that you obtain for your consignors. To say the least I was very happy with the results. I cannot begin to express my thanks for your kindness during a very difficult and stressful time. I was at a loss and contacting your company was the best solution to all my problems. You took control and handled everything for me and I would not hesitate to use your company again or to refer you to anyone I know. Thank you so much for coming to the Kick It Up Party and helping us raise funds for the BCYF Exhibitor Premium Fund! Words cannot adequately describe our gratefulness for your contribution to the event. Without your help, our event would not have been as successful. On behalf of the St. Joseph City Commission, Susan and I want to thank you and your wife, Aimee, for volunteering your time and services on September 29th when you auctioned the 2012 public art display. Not only do you have the professional skills of an auctioneer but you are a true entertainer as well. You did an outstanding job; in fact, it was our best auction ever. We hope you will allow us to call upon you to assist with future auctions. Again, we appreciate all that you do for our community. Thank you. With your generous support of the Bucket List Evening and Auction on Saturday. Big Brothers Big Sisters was able to raise approximately $10,000 to $11,000 to help fund a part time case manager in 2012. The Board of Directors and staff joins me in extending our deepest thanks for "sharing your skills" with BBBS for the evening. You made it look so easy, although I am sure it was not! You and Aimee were a joy to work with, and we do so appreciate your generosity. This past October, the City of St. Joseph contracted with Big Bear Auctions, LLC to assist us with clearing 20 years of inventory that had been replaced, upgraded, or just no longer needed. City staff had no idea about how to coordinate this overwhelming effort as there was much inventory and many city departments involved. Well, Jerry Glassman and his team knew exactly what to do! In fact, Jerry went above and beyond our expectations by voluntarily attending pre-planning meetings with city staff on a number of occasions all the while being very aware of government regulations and procedures; and Aimee welcomed phone calls and emails, always graciously answering our questions timely. The Big Bear Auctions team truly coordinated this effort from the very beginning. City staff was pleasantly surprised by the positive experience and truly enjoyed working with Jerry and his team. When talking about the auction among staff following the event, everyone was in full agreement when one staff member noted, “not only were they [Big Bear Auctions, LLC] experienced professionals and courteous, but you can tell they sincerely love what they do. It is awesome to watch them in action!” On behalf of the St. Joseph City Commission and staff, kudos to Big Bear Auctions LLC. Thank you for your hard work and dedication, and we look forward to working with you some day in the future. Thank you so much for the auction. Everything was so great. It was fast, fair and more then I expected. These people have their stuff together and have great knowledge for what they are doing. Fees and terms are fair. The staff members are friendly and hard workers. The organization and set-up of the auction was quick and easy, port-o-let was on site, along with food and beverages. If you are looking for an auction company, this is where it's at. Jerry is super helpful, friendly, and very knowledgeable. I would definitely recommend him to get \"it\" sold for a favorable or better price. Thank you for your phone message on Monday. As usual, you & your auction staff exceeded our expectations - Big Bear is the best aucton company in 4 counties. Jerry is more knowledgeable and the best auctioneer.